Friday’s Fresh Five! (11/11/11) | What about this? The sun was low in the sky on a crisp and breezy autumn day. It was the kind of day that beckoned for a stroll in the park. As the black lab puppy strained against his leash to see more, smell more, and play more, my husband and I walked and chatted. As we rounded a path leading down to the bay, I suddenly yelled out to him, “Stop! 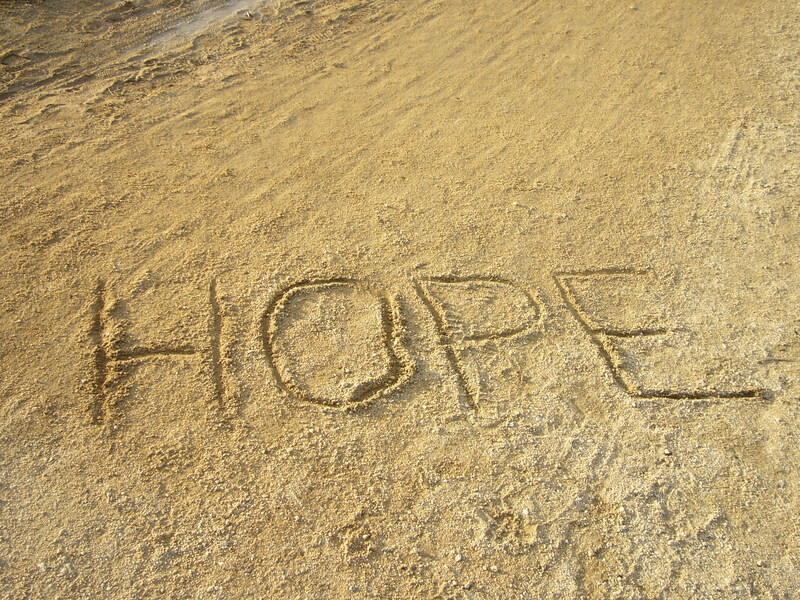 Don’t step on someone’s hope!” There at his feet, scrawled in the decomposed granite path, were large letters spelling out the word “hope.” As we continued our walk, my mind filled with questions. Who wrote that? And why? Does that person have hope or need hope? Or was it just someone’s name? I’ll never know the answers to my questions, but I do know that hope can be found everywhere. Recently in my small area of the world a Convoy of Hope came to town. Over 13,000 people attended this outreach to receive assistance ranging from “health and dental screenings, family portraits, groceries, clothing, shoes and employment – all of which were free of charge.” Convoy of Hope has ambitious plans for 2012; their plans include outreach events in every state. To read more about this charity that has won the Charity Navigator Four Star Award for seven years in a row and to learn about ways in which you can help, click here. My husband called me from work the other day and asked, “Do you have any use for a box of assorted flower vases, because if not, they are going to be thrown away?” He knows me too well. Since it is not in my nature to throw things away, I replied, “Bring them home. I will fill them with flowers and take them over to a senior care home.” Although vases are not required in order to give a bouquet of flowers to someone in a senior center or home, they certainly make it easier for the staff to distribute the flowers. I mentioned in a previous post, that glass jars work great for this purpose, too. So before you get rid of those inexpensive vases you get from the florist, fill them with lovely flowers from your yard or from a store and give a home-bound senior hope that someone still cares about them. #3 – Is There Hope For Mom and Dad? The text I sent my daughter read something like this, “@ emerg room. Dad mayb hd gdasu buvacj!” I admit that sometimes when I text, I inadvertently send jibberish instead – thanks to clumsy fingers or that darn spell check program that keeps changing what I write! I’m sure I’m not the only one with texting issues. Read these amusing texts that appeared on the Huffington Post Parents page or read many more funny texts by going to When Parents Text. I hope my kids haven’t submitted any of my bloopers! This four minute TED video presented by Gever Tulley shows hope exists when creativity is fostered in children. His Tinkering School allows children to design, create, succeed and fail. Life skills are learned when they have to figure things out. I love this idea! Give thanks this weekend to the many people who gave hope to our country by serving in the military! Have a safe Veterans Day weekend!